The cutting action of the filaments of abrasive nylon brushes are unique compared to traditional metal filaments that are designed to cut on the filament tips. Abrasive grains encapsulated in the nylon are exposed on all surfaces of the brush filament. Abrasive action occurs on both the tip of the nylon brush filament as well as the nylon filament sides. In application, the lateral surface of the nylon filament is often drawn across the work surface, functioning much like a flexible, abrasive file. Filaments of abrasive nylon brushes are composed of heat stabilized nylon and abrasive grain that are coextruded into monofilament brushes. The results are flexible, homogeneous nylon abrasive brushes that have approximately 30% abrasive loading by weight. Common abrasives used in this material include aluminum oxide, silicon carbide and diamond. Filaments of nylon abrasive brushes are produced in a variety of filament diameters, abrasive grain types, abrasive grain sizes and abrasive loading. As abrasive grain size increases so does nylon filament diameter. Larger nylon diameter filament is required to effectively bond larger abrasive grains. Larger nylon diameter filaments are less flexible which make them more susceptible to brush filament fatigue and fracture. Smaller diameter filaments bend and recover more easily and more filaments can occupy a given area putting more brush abrasive in contact with the workpiece. Brushes made from abrasive nylon should not be run faster than 3500 SFM to avoid overheating and material transference. Abrasive nylon brushes are ideal for light deburring, surface finishing and finishing of irregular profiles. 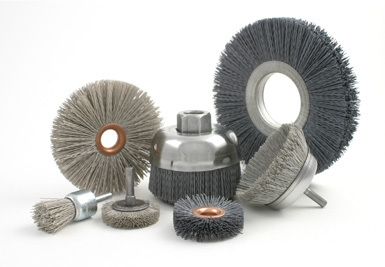 Abrasive brushes made with abrasive nylon include wheel brushes, cup brushes, end brushes, disc brushes, mandrel mounted brushes, copper center brushes, radial coil brushes and twisted-in-wire or tube type brushes. Abrasive nylon cross hole deburring brushes can be produced in diameters as small as .032 and are ideal for miniature deburring applications. Nylon Abrasive Tube Brushes: brushes are great for internal diameter applications. These nylon abrasive brushes improve product quality by internally cleaning and removing imperfections. Abrasive nylon wheel brushes are made in diameters from 6” to 14”. Copper center abrasive nylon wheel brushes are made in diameters from 4” to 1”. Abrasive nylon end brushes are produced in ½”, ¾” and 1” diameters. Mandrel mounted nylon abrasive wheel brushes are made in diameters from 1-1/4” to 3” and feature a ¼” shank. Abrasive nylon cup brushes are produced in 1-3/4” and 2-3/4” diameters and have a ¼” shank while larger diameter cup brushes are available in 4” and 6” sizes with a 5/8”-11 threaded adaptor. NamPower® abrasive nylon disc type tools are available in diameters from 2” to 5” and feature a dense, uniform fill which makes them ideal for automated and semi-automated machine applications. Brush Research manufactures our abrasive nylon deburring and finishing brushes under the most rigid quality standards. As an ISO 9001:2008 certified company, BRM is committed to making quality abrasive nylon brushes. 100% of our abrasive nylon deburring and finishing brushes are made in the USA. We offer application assistance and a full test lab for your most difficult projects.